Another Health and Wellness Post ~ Not really! I having been dodging a craving for poutine all week. Don’t ask me why, it is not even a favourite of mine or anything. I seriously have probably only ordered it about 4 times in my entire life (I can’t say the same about fries and gravy though). So, I am not sure why I have had poutine on my brain, but I have. We spent all day doing laundry, minor projects around the house and some cleaning and by supper time I was ready to cave and give into my craving. Because I really don’t eat poutine, I didn’t even really know where to get it. I went to good old Google and found a place just up the street from us. They advertise homemade burgers and great poutine. Much to my families surprise, I was the one in the hunt for a not so nutritious meal. I came home with “Super Boys” and Poutine. The burgers were loaded with the works, including chili. It is has been so long since I ate a meal like that, I actually couldn’t do it. 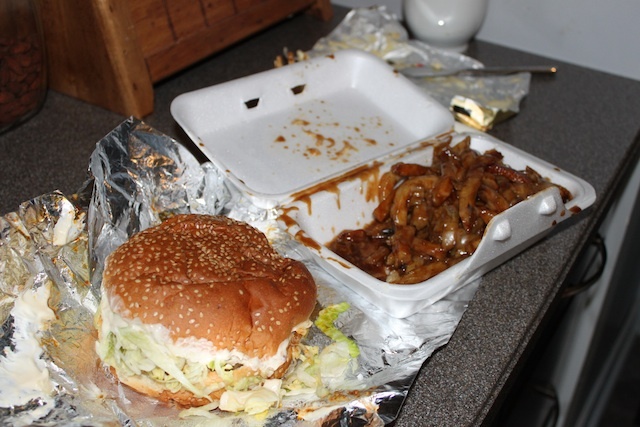 I managed to eat about a half-dozen mouthfuls of fries and about 1/2 of my burger, but that was it. I generally have a large appetite and can put away more food than the average female, but this was too much for my tummy. I guess that all that healthy food has made my body into a bit of a “food snob” ~ Ha! Ha! I never would have guessed it, but despite my craving, there was no way I could choke that down. The bad news is I wasted about $10 on greasy food that I couldn’t even eat and didn’t enjoy. The good news is that I didn’t bother consuming the rest of the empty calories and felt fine with leaving it unfinished on my plate. Like I said in an earlier post, we strive to eat well most of the time, but I truly love food and have no intention of depriving myself from the things I love every single day of my life. Let’s get real! I am glad that I went ahead and gave into the craving, as it left me so dissatisfied and disgusted that I won’t be in a hurry to do that again, anytime soon. My stomach was churning and cramping in response to the shock my system got from the food. In the future, I will be saving up my indulgences for a great big piece of very chocolately cheesecake ~ guaranteed not to disappoint! 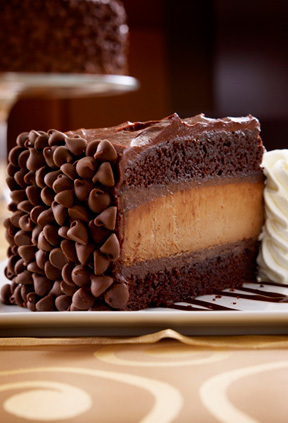 Photo from Cheesecake Factory Menu – Yummy! 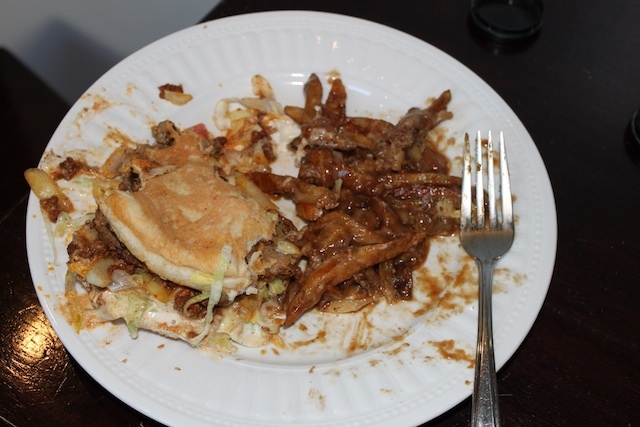 Posted on July 21, 2013 by Cindy Roy •	This entry was posted in Health and Wellness and tagged chocolate cheesecake, homemade burgers, only human, poutine. Bookmark the permalink. ← Bananarama Bo Bama ~ Going Bananas or Bananas Going?